I am grateful to the Board of Regents and President Johnson for reassessing the issue and making the right decision in the best interest of the State that will serve generations to come. Our greatest resources lie within our youth and the Regents and President have now assured that they will receive the best education with home-grown teachers. I am also very proud of the way our community came together to support our educational needs. The avalanche of opposition to the Fairbanks move in the end triggered the amendment to keep the school at UAS. SHI was involved early on in the quest to keep the School of Education at UAS. Public policy advocacy is a task we do frequently, and I offer my testimony below to give people a peek into our efforts at the state level. I was alarmed to learn recently that the University of Alaska President James Johnsen is proposing to consolidate the school’s education programs into a single college of education based in Fairbanks through the Strategic Pathways initiative. We appreciate his effort to address our fiscal crisis, but I cannot believe his selection of Fairbanks is in the best interest of our students and need to fill the ranks with Alaskan trained teachers. If this proposal is adopted by the regents, we urge you to base the education college at the University of Alaska Southeast (UAS), which has a proven track record in teacher education and strong partnerships with rural communities and Sealaska Heritage Institute (SHI). SHI has a long history of collaboration with UAS and in 2013, we formalized our relationship through a memorandum of agreement, in which we agreed to support, design, implement and sustain existing and new projects and programs. Through our partnership we have been able to offer cultural enrichment for teachers which we believe has contributed to enhanced education and reduction of student dropout rates. We have collaborated with UAS staff on numerous programs, including Preparing Indigenous Teachers and Administrators for Alaska Schools (PITAAS). The PITAAS program was founded as a scholarship program for Alaska Native students and to create a community of people to act as a safety net for students. This is important because students who come from villages often are overwhelmed by Alaska’s cities. Too often, this culture shock results in Native students dropping out of college. SHI in 2015 conducted extensive interviews with recent PITAAS graduates on why the program was important to them, and the safety net they had through PITAAS was ranked as one of the most important components of their academic success. We have spent years building the PITAAS program and believe it is one of the best options for rural students pursuing a college education in Alaska because of the safety net and the large Native community and cultural events at the Juneau campus. SHI partners with UAS to develop and implement the PITAAS program, which includes cultural orientations by SHI for educators and administrators who operate educational programs in Juneau for Alaska Native students from rural areas across the state. SHI also is operating a robust outreach program to publicize PITAAS to Native college-bound students in Alaska. Through the outreach program, SHI in 2015 produced three promos featuring PITAAS graduates that reached more than 235,500 people statewide through television spots, YouTube pre-roll ads, social media and eblasts. In early November, SHI and UAS administrators held a planning session to expand the PITAAS program to grow the next generation of Alaska Native leaders through a leadership initiative. What would the single-college proposal based in Fairbanks mean for this successful and vital program? Finally, if the university does adopt a one-school approach, I would hope to institute a place-based, Alaska Native preference for the position. We already lack enough Native educators in leadership positions, and we need Native representation on the Department of Education and Early Development (DEED) board and the UA Summit Team. 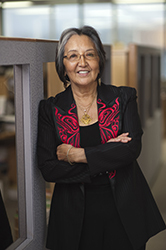 We also need to see Alaska Native leaders running the Alaska Native Science and Engineering Program (ANSEP) and the Rural Alaska Honors Institute (RAHI). Thank you for the time and effort you commit to fulfilling your duties as regents and for considering my comments, concerns and recommendations.